Alt-text: "I recognize that chocolate is its own thing on which reasonable people may differ. Everything else here is objective fact." Let the food arguments begin. I'm not surprised about licorice's place in the spectrum but I'm kinda saddened that it's so unappreciated. Why is watermelon on the pink and green bars? if the pink is for the flesh, why is the green rind so good? What color is your (edible) parachute? A rose by any other ... color... would taste just as sweet . Popcorn on the 'bad' end of the scale? Outrage. Popcorn is delicious. Blue and purple are the weirdest tasting colours. Red is a tricky color for tastiness. You have to watch out for the rogue cinnamon that (while on its own is not a terrible taste), is near vomit inducing if you're expecting cherry or strawberry. Why is orange on the "bad" end of the scale? Orange is the best candy flavor. Not so much a licorice fan, at least the black color ... red licorice ain't bad. But why only "licorice" in the black group? Should also include blackberries and poppy-seed, both of which I'd put on the "good" side of the spectrum. EDIT: Oh yeah ... and Black Jack gum is pretty good too, probably because it has enough sugar to offset the black licorice flavor. Last edited by Heimhenge on Wed Mar 15, 2017 5:21 pm UTC, edited 1 time in total. I have problems with this. First, licorice deserves a far higher placement, as does lemon, orange, coffee, and popcorn. White chocolatey is way too high, as is cotton candy. Either way, I thought this comic was humorous and I enjoyed it. I'm reading this entire chart as having to do with "artificial flavors" of things like hard candy. There are other parts I wouldn't necessarily agree with (like for example the ordering of white chocolate and vanilla is accurate, but they both need to move to the right; I imagine he didn't so much leave out coconut as place it so far on the left that it failed to show up on the picture, which is an entirely accurate placement), and other parts that require a specific interpretation/context to make sense (popcorn is a fine flavor as popcorn; in a jelly bean, not so much). I imagine watermelon shows up under both red and green because sometimes, watermelon-flavored items are colored green. freezeblade wrote: I'm reading this entire chart as having to do with "artificial flavors" of things like hard candy. I would read this as referring to things that are generally selected by color, rather than by flavor. (With a partial exception for chocolate). Jellybeans, skittles, etc. No one asks for "lime" skittles, they say "can I have a green one". In particular, given the time of year, jelly beans. In which case, most of the questionmarks on the white line are variations on Coconut. I'd love it if "green" reliably meant "lime" and not some atrocity like "sour apple" like it seems to these days. That said, I'm taken back to college when every week before heading off into the mountains we'd stop at Snappy Mart for a couple of Slush Puppies (SM's answer to the Slurpee/Slushee/Icee). Bright primary colors whirling in the guts of the machine, most of which were pretty representative except for blue. My buddy got curious and asked what flavor blue was and was told "coconut", which makes about as much sense as any other conceivable option, but from that moment it became his preferred Slush Puppy flavor. Flash forward about twenty-five years. I'm back in the same small town for a week with my girlfriend, and we stop at a Snappy Mart so I can share that part of my history. Two blue Slush Puppies follow us to the car and we start sucking on them, but now the flavor is clearly not coconut. It takes a few good pulls before I'm able to pin down what I'm tasting, which it turns out is kerosene. You don't have to swallow a lot of frozen blue kerosene for the taste to remain with you the entire rest of the day. Yep, raw vanilla extract is a dark brown (assuming you've gotten the good stuff). You know you've got the right stuff if it comes packaged in clear glass and the liquid inside is opaque. We Americans hate to admit it, but fat is what makes good food taste great. DanD wrote: I would read this as referring to things that are generally selected by color, rather than by flavor. I agree, that's the context that makes the most sense. To that end, I'll throw down the gauntlet and assert that Red Vines are neither strawberry nor cherry, but some fantasy flavor. And it's an abomination. In contrast, red Twizzlers, while not actually strawberry flavored either, are manna of the Gods and the only vine-like comestible fit for human consumption. 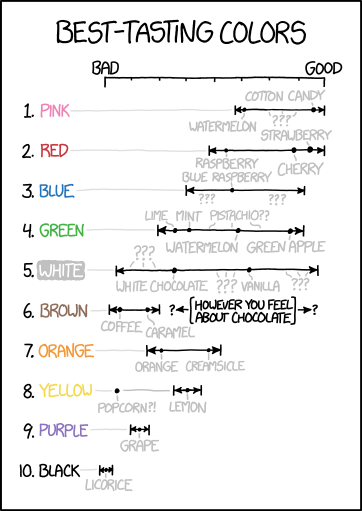 All other colors of vines/Twizzlers are heretical and peg the Y-axis of Randall's chart. If it's holy wars... Crisp(/Chip) Packet colour theming, by flavour. I guess we're all a bit synaesthetic between colour and taste. This reminds me of two separate gags from the British comedy canon. One is an episode of some 80's sitcom (I'm thinking something with Ronnie Corbett) where there's a tub of red substance labeled simply "jam". The protagonist protests "it can't just be jam; is it raspberry, strawberry, cherry?". Then he tastes it and says "yeah, that's jam". The other is from the Meaning of Liff, which defines "Masbury" as more or less exactly that nonspecific fruit flavour. Depends. The original yellow color of both (some) butter and cheddar cheese was naturally occurring, when cows grazed particular mixtures of plants that were high in beta-carotene. You are correct that any such color in modern high volume products is artificially introduced, but you can still sometimes find in natural product from certain areas. That is definitely true. Popcorn flavored candy doesn't deserve existence. It's terrible. Zinho wrote: We Americans hate to admit it, but fat is what makes good food taste great. Yeah! I'm all for fatty foods! One of the best things I've ever eaten was bacon confit. Make a nice slab of bacon. Cut it into cubes. Place the cubes in a jar full of lard and bacon grease by slowly letting them simmer in the fat for a while. Let the jar sit for a couple months. Take them out, and deep fry them. You get a cube that is crispy on the outside, but super tender, moist, and falls apart in your mouth on the inside. Some people just can't appreciate good flavor when it hits them. I don't care. It leaves more for me. Brown is missing Root Beer flavor. Though I understand this tastes like medicine flavor in certain countries, sort of like how cherry flavor equates to medicine flavor in the US. I am also offended by liquorice being so low. Even more than I am by the spelling "licorice".